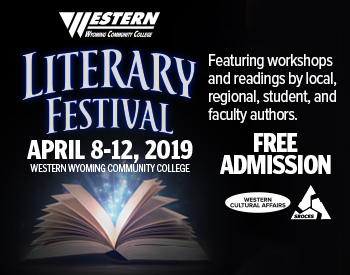 Western Wyoming Community College is hosting the first annual Literary Festival on campus April 8th-12th. The Literary Festival is designed to celebrate creative writing in the community. There will be a variety of readings and workshops facilitated by English department faculty and featuring original work of local, regional, student and faculty authors. The festival is loosely based around fairytales and culminates with the opening of the Theatre department’s Into the Woods. Western hopes to attract writers of all ages and stages, as well as those who simply enjoy the literary arts. The goal is to celebrate and enjoy the art of writing as well as open the eyes of would-be students to the Creative Writing programs and courses at Western. This event is sponsored by the Western Wyoming Community College English Department as well as Cultural Affairs. The Literary Festival is free and open to the public, the community is encouraged to attend. For more information regarding this event, please contact the English Department at english@westernwyoming.edu or look on Western’s community app, Mustang Connections at www.westernwyoming.edu/app.